KING OF PRUSSIA, Pa. - As part of its annual member luncheon, November 21, 2014, the Valley Forge Tourism & Convention Board (VFTCB) announces a new recognition program. The award celebrates area attractions, historical sites, hotels, restaurants, museums, galleries, event holders and other businesses that burnish the reputation of Montgomery County, Pa., as a visitor destination. The initiative was born of the new direction the organization took throughout 2014. "Based on feedback from our Board of Directors, our high-profile stakeholders and our membership, our organization reinvented itself this past year," says VFTCB President Bill Fitzgerald. "We are riding the crest of that momentum, being propelled onward with a new outlook, a new mission statement, a new logo, a new website - even a new name." He continues: "Our rally cry became ‘Make It Montco,&apos; which evolved into our social media tag for collecting shared experiences from locals and visitors alike. "What we found is that many of our member institutions were similarly being inspired, catching our fire. They began reimagining their operations in new and engaging ways, expanding the ways we promote Montgomery County. "Our new award program recognizes those new programs, experiences and accommodation and dining options. It is our means of celebrating our visionaries. We have named them the Stellar Awards, reflecting not only spectacular performance from our members but also their importance in our new brand, evidenced by the stars in our logo," Fitzgerald concludes. Valley Forge National Historical Park, for its innovative collaboration with the Culinary Arts Institute of Montgomery County Community College. Faculty and student pastry chefs were tapped by the Park staff for a custom-designed birthday cake for George Washington&apos;s Presidents Day celebration this past February. The co-winners who accepted were Kate Hammond, Superintendent, Valley Forge National Historical Park, and Chef Francine Marz, Director, Culinary Arts Institute, Montgomery County Community College. Elmwood Park Zoo for its consistent forward-thinking programming to not only educate visitors but to engage them in unexpected and vibrant ways. Among many noteworthy additions to the zoo is Treetop Adventure Park, which brought ziplining to this 90-year-old Norristown attraction. 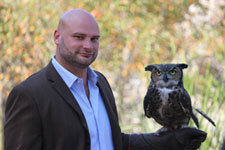 Marketing Director Shaun Rogers received the award on behalf of the zoo&apos;s Executive Director, Al Zone. The Montgomery Bar Association&apos;s Courting Art Program, a beautification project that solicits paintings and sketches from local senior citizens. The art serves a promotional purpose, highlighting Montgomery County sites, as well as making for a welcoming and enticing visitor experience within Norristown Courthouse, the county seat. The Honorable Carolyn Tornetta Carluccio, Montgomery Court of Common Pleas, accepted the Board&apos;s recognition on behalf of the Montgomery Bar Association. Fitzgerald summarizes: "We at the VFTCB look forward to the Stellar Awards becoming a time-honored tradition in recognizing our members. We hope it inspires the county&apos;s tourism industry to greater heights and continues to broaden our appeal to visitors from all over." The presentation was part of the VFTCB&apos;s annual luncheon, a comprehensive update of the status of the organization&apos;s progress in promoting Montgomery County as a destination for consumer visitors, group tours and conventioneers. Fitzgerald cited significant progress in marketing the entire county, using the landmark Valley Forge National Historical Park and the popular King of Prussia Mall to encourage visitors to explore numerous other tourism assets. Of note were the statistics that hotel occupancy grew four percent and weekend hotel business was up six percent. The VFTCB staff also debuted a new video, "Think beyond the Meeting," targeted to the meetings and event planners&apos; market. He also let the nearly 300 attendees know that his organization, along with the rest of the area, is proud, eager and ready to serve the needs of the World Meeting of Families, coming September 2015. Fitzgerald noted the County&apos;s proximity to Center City, only 18 miles by car, make it a prime location for guests arriving from all over the world. He excitedly led the crowd in a rally-cheer for the confirmation of the participation of Pope Francis, whose appearance is expected to propel economic impact within the County an estimated approximately $10 million, resulting from over 7,000 room nights.